A gorgeous cold blue day, a proper sunny start-of-spring morning over the Lincolnshire Wolds. Seen from afar as a modest green bar on the horizon, the Wolds loomed close to as a considerable wall. 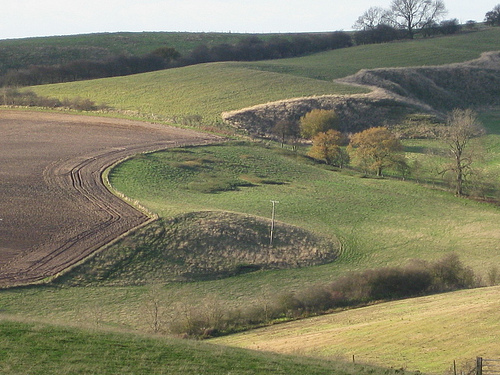 This long whaleback of limestone and ironstone rises some 300 feet above the Lincolnshire plains, a height lent grandeur by the flatness of the surrounding landscape. Views west and south from the top are quite spectacular in clear weather, and that’s exactly what today held in prospect. Claxby to Normanby-le-Wold, suggested the map, and then on via Otby and Walesby to Risby. So many ‘-by’s in this part of the world – the Norse word for a farmstead, denoting where 9th century Danish invaders settled and beat their swords into ploughshares (to some extent). I strode out up the hill from Claxby, picturing the village’s founder, one Klakkr – rather a fierce fighter, I guessed, carrying the smack and clatter of swords in his name. Up in the wind on the wold top at Normanby, I found the Viking Way long distance path and followed its horned helmet symbols down to lonely Otby on its ridge, then on to Walesby tucked into the valley below. Walesby folk have not always dwelt in the vale. 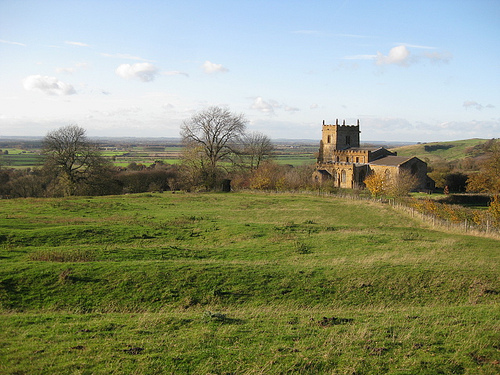 Their 14th century forebears fled the plague-blasted settlement around the church of St Andrew on the hill. Today’s low sun picked out the ancient foundations of their houses and fields around St Andrew’s – known to generations as the ‘Ramblers Church’. It became the focus of local walkers’ expeditions in the 1930s, when it stood in romantic ruins. 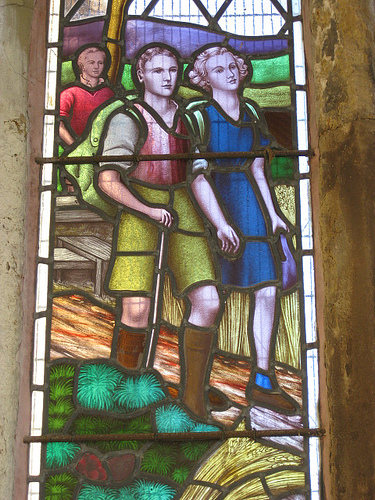 Nowadays there’s a most beautiful stained glass window depicting a red-robed Christ beckoning across a cornfield to a trio of clean-limbed young ramblers of the old school, while a brace of 1950s cyclists waits to attract his attention. 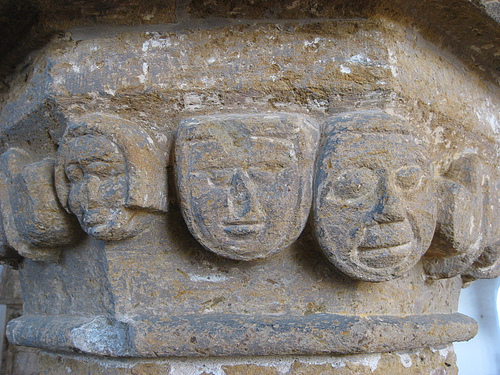 Medieval masons carved a jostle of cheeky, coarse-featured faces among the stone foliage of the nave pillars. I took some snaps and had a chuckle, then followed the Viking Way on along the ridge. 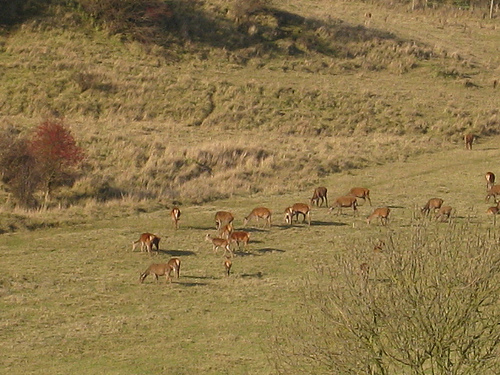 Near Walesby Top a herd of 40 red deer watched me pass. The flock of pedigree Lincoln long-wool sheep at Risby – hefty beasts with a llama-like hauteur – stared through their floppy fringes as if mesmerised. And I stared back beyond them, way beyond my homeward path and out west to the edge of sight, where an apocalyptic setting sun sent Blakean shafts from blackening clouds to pick out the two towers of Lincoln cathedral on their ridge some twenty miles away. 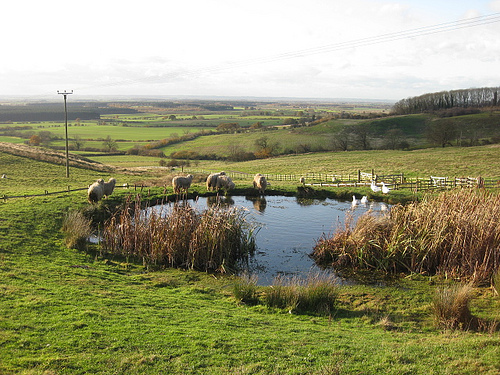 Walk: (8½ miles, moderate, OS Explorer 282): Follow Normanby-le-Wold road (signed) uphill. 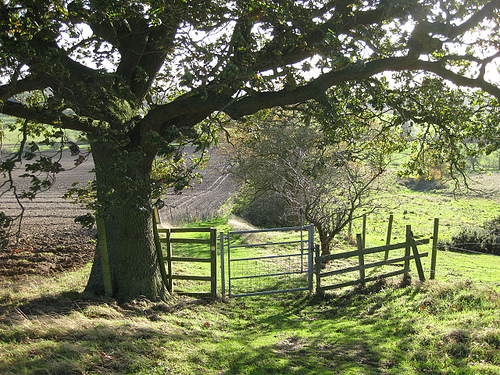 Right by reservoir (118948; footpath fingerpost), up side of wood, through 3 gates to road (123949). Right past Normanby church; follow ‘Viking Way’/VW. After 3 fields, leave VW (125936); ahead (fingerposts, yellow arrows) to valley bottom. Left (130930; fingerpost) to end of paddock (133933); uphill to Otby House drive (139935). Right to road; right into Walesby. From crossroads by village hall (134924) follow VW for 1¼ miles past Ramblers Church (138924), Risby Manor and Castle Farm. In valley bottom beyond, right (152911; fingerpost) across fields to Catskin Lane (142917). Forward for 1/3 mile; right (136919) on footpath (fingerpost) into Walesby. Follow VW out of village; right (130924; ‘Mill House Farm’). Left at fork (129926; ‘Byway’); left off VW (127931); follow ‘Byway’ to Claxby.